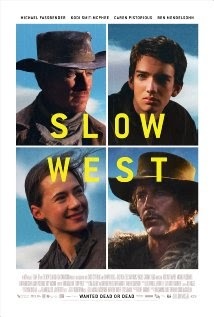 Movie Review: “Slow West” represents an auspicious debut for writer-director John Maclean who incorporates old and modern formulas to turn this western into an eventful 19th century’s odyssey that brings a madly-in-love 16-year-old Scottish boy to the American West, looking for his true love. Jay Cavendish (Kodi Smit-McPhee) is the boy in question and the girl he’s trying to find is Rose Ross (Caren Pistorius). What Jay doesn’t know is that Rose is wanted dead or alive, a situation that drives several bounty hunters to the region, eager to put their hands on the $2000 reward. Fortunately, Jay won’t do this trip alone, counting with the gun skills of a lonely drifter, Silas Selleck (Michael Fassbender), the narrator of the story, who offers himself to protect him from hunters, desperados, and Indians. Among the bad-asses, one is particularly feared – Payne (Ben Mendelsohn), a sly wolf who made a pretty funny appearance; with a cigar between his lips and covered in a big fur coat, he asked Silas in the middle of the woods: ‘may I enter?’. Along the journey, Jay and his secretive pal will come across good and bad people, but among all the situations, two of them are definitely good: the first was when Jay was forced to shoot down an intimidating immigrant mother; the second happened when during a furtive Indian attack, he avoids an arrow from hitting his face in an exceptional reflex. Gorgeous landscapes accommodate these precipitate encounters, which circumstantially are suspended by flashbacks of the protagonists’ past. Jay’s sense of purity, endless passion, and astute observations are what propel us being fond of him. As for Mr. Maclean, who managed to follow his own orientation whenever it was justified, praise should be given to him for cooking the plot with homogeneity and no pressure, and for setting up a memorable climax built on a rousing final shootout.